We have released user accounts on Grabilla website. Now you can login to Grabilla not only with social accounts, but you can create Grabilla account with email and password. Some users do not have social accounts or concerned with privacy and do not want to share their details with third-party sites. To allow such users to have account on Grabilla site we have added classic email\password account to Grabilla. Most of features are self-explainable, but nevertheless here’s short manual. This is new login form where you can enter your email and password and login to your account with your screenshots history. To register you need to click on Create new account and enter email address. Your email is your login. Then you’ll receive email with confirmation link. We need to do so for spam prevention. Click on the link in email and your account will be confirmed and your generated password will be mailed to you. 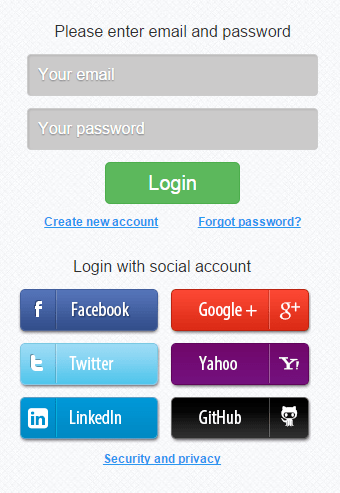 Then you can login on site with email\password. If you forgot your password you can reset it using Forgot password link. Enter your email and you will get password by email. Your social accounts that use same email address will be automatically linked to new Grabilla account. 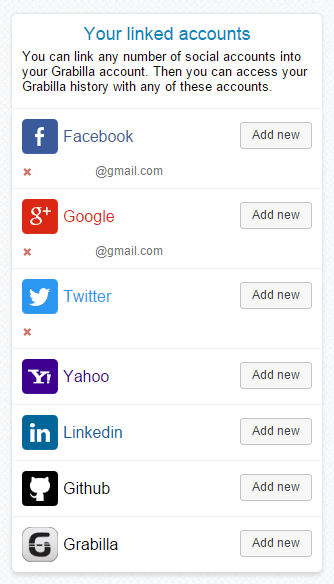 You can link Grabilla account to your current linked social accounts. To change your password you must click on Change Password button in Your linked accounts block. Then you have to enter your old password, new password and password confirmation. Click Change password button and your new password will be set.